A year ago if you asked me what my go-to nail polish is, I wouldn't have hesitated for a second: Fiji by Essie. And I'm pretty sure 90% of the female population would say the same. The other 10% would name a different color, but Fiji would most likely be their vacation / summer manicure color of choice. Fiji is undoubtedly one of the best nail colors in the game - but I actually discovered a color that's even better than the queen of all "I want to look tan" polishes. OPI's "Mod About You". In Essie's defense, or even OPI's (depending on your feelings about pink), Fiji is more on the whiter side giving you that marshmallow, yet pink, look. 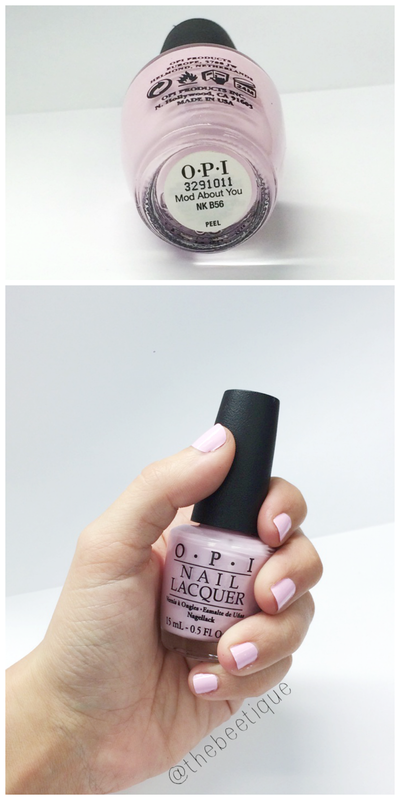 OPI's Mod About You is more of a vibrant, solid pink, OR should I say a vibrant, solid, Fiji. Although I'm not the biggest fan of pink in general, I still dig Fiji by Essie. Rocking Mod About You by OPI is THE BEST alternative when you want to switch it up, but still want to achieve that same chic, spring look. Oh, and it goes on perfect and effortlessly - ain't no sheer polish here. 2 coats and you're solid. Literally. also a part of OPI's GelColor line - ask your nail tech about it!